The Cheshire Show, now the Royal Cheshire Show, was held on the 21st and 22nd June . As with the last two years, Ro was in charge of Hospitality, and Mary D was , again, as she does every year, officiating in the main tent. Six of our members had volunteered this year to help with the refreshments, on the Wednesday morning 8.30 to 11.30 shift. Margaret D and Pat S were on 'food to go", Anne T was helping Ro in the hospitality cabin, and Chris , Marian N and Sandra spent a happy morning icing cakes. We were all suitably employed, and had a very enjoyable morning , followed by a WI lunch and a couple of hours wandering round the show. This year, Kelsall fielded four entries in the competitions. 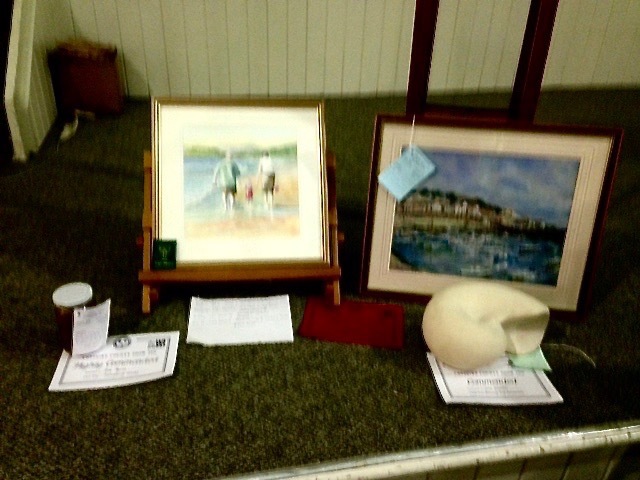 Dot entered her gooseberry and elderflower jam, Margaret D entered a watercolour painting, titled Glyn, Margaret and Ella on the Beach, Audrey entered a pastel painting of Mousehole Harbour , and Jill M entered her stone carving of a nautilus shell, which she had done during her bursary course at Denman College. As always, the standard of all the entries was extremely high. Margaret was delighted to be awarded full marks and first prize for her painting with some of our other entries also being either commended or highly commended. We were very pleased that Kelsall had four entries this year, especially since in some recent years we have had no entries at all - we were especially pleased that the entries had done so well.